Mitchell-Innes & Nash will participate in Art|42|Basel, Booth E9. The gallery will exhibit a selection of works by 20th-century masters. Highlights include sculpture and an early wood relief by Jean Arp; photographs by Constantin Brancusi; a collection of small works by Alberto Burri; a standing mobile by Alexander Calder; etchings by Lucian Freud; important works on paper and a painting by Alberto Giacometti; works by Leon Kossoff and Anthony Caro; a large-scale sculpture by Roy Lichtenstein; and 1960s paintings by Kenneth Noland. ALEXANDER CALDER The Lookout 1957 Standing mobile, painted metal, rod and wire 52 5/8 by 42 1/4 by 12 1/4 in. 133.7 by 107.3 by 31.1 cm. 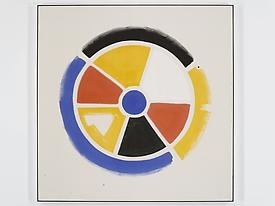 KENNETH NOLAND Highlight 1961 Acrylic on canvas 69 by 68 5/8 in. 175.3 by 174.3 cm. ALBERTO BURRI Black Cretto 1974 Mixed media in artist's frame 1 7/8 by 3 1/2 in. 4.8 by 8.9 cm. JEAN ARP Torse-feuille 1963/82 Bronze Height: 33 13/16 in. 85.9 cm.